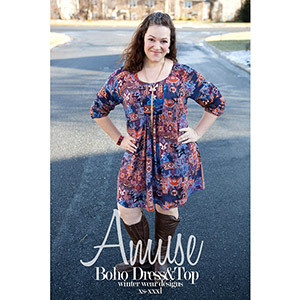 The Amuse Boho Top and Dress is a relaxed fit raglan pattern. 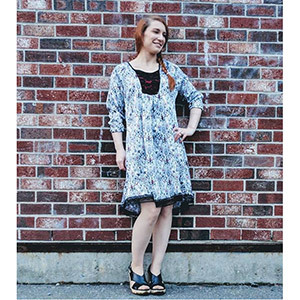 This pattern has a large scoop neckline with an optional button front. There are 2 sleeve lengths included. This top hits at mid to low hip for a woman 5'4"-5'6" and can be paired with jeans, skinnies, leggings or pencil skirts for a variety of looks. The top hits right at mid hip while the tunic length hits just below the bum, both are a curved shirt tail and have the option of a vented hem at the side seams for more ease around the hips, or a closed hem. For the dress, there are options of a straight or a shirt tail hem in mini, above knee, and knee length. 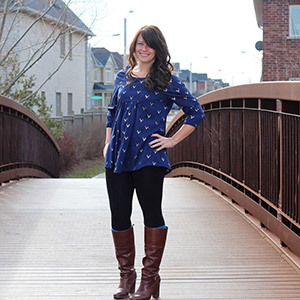 Pair the dress with leggings or great tall boots for the ultimate boho chic look. The longest dress length hits right at the knee, with an above knee and mini length given as well to show off as much or little leg as desired. This pattern is available in sizes XS to XXXL. 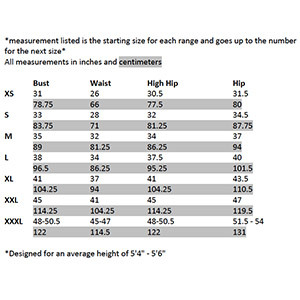 Suggested fabrics are cotton jersey, wovens,voile, chambray, or quilting cottons.